Being known as a documenter of life's details, the notes that Dad used for his speech at our engagement party were passed onto me. About two years ago. A Story Starter from Simple Scrapper's February membership collection - the theme for this month is Quotable - gave me to motivation to finally get these notes recorded on a scrapbook page. With only a paper copy of the speech notes I decided against recreating them digitally, either by photographing or retyping, and instead designed the layout around their size. I've used a bright patterned paper from the Maggie Holmes Shine paper pad as a background and included a couple of small photos in support, but the words - Dad's words, with probably some input from Mum - really are the feature of this page. Two years on, I'd already forgotten the detail of much of Dad's speech. (Being pleased Mike had no existing football allegiances is the notable exception, as that part I remembered!) Having these notes, being able to read them and be reminded of the love and support, both now and in the future, just makes me happy. This is why I scrapbook. 2015 was the year of the pregnancy announcement in our friendship group - you almost wonder if there was something in the water! - and February's sketch templates from Simple Scrapper's membership collection gave me the inspiration to grab some screenshots from Facebook and record them. I feel like I didn't dilly dally too much selecting products for this layout, making a choice and moving on rather than continuing to look for something else that might be that little bit better. Hopefully that's something I can continue to improve on! Supplies include Crate Paper Hello Love epoxy phrases, Maggie Holmes Shine paper pad and Heidi Swapp Color Shine. The little onesie background was cut with my Silhouette Cameo, a leftover from another project hanging around my desk that I was glad to put to use. We celebrated with dinner at Bar Nonno, a new-to-us place suggested by my sister. With lots of chatting, laughs and dueling conversations, it was a great evening. I know the others think the same because I received three different text messages the next day - from Mum, Dad and Jenna - telling me so! I often forget to photograph the cards I make, frequently finishing them not long before we head out the door with gift in hand. So while these might be phone photos in lousy light with messy desk in background, at least I remembered this time! I used my Silhouette Cameo to cut the phrase and back of the card out of double-sided patterned paper, giving me the blue dot and pink contrast. The font used is ChunkFive. I used a white cardstock insert for an easy to write on surface, attaching the message with dimensional adhesive. Some pearl bling, because Mum loves adding bling to cards, as a finishing touch. Happy Birthday Mum! Glad you had a wonderful evening. 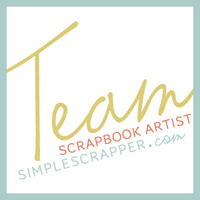 I love checking out the shiny new scrapbook products as they're released at CHA. (Scrapbook.com has a range of videos; Scrappy Jedi has booth photos and links to manufacturer's sneak peeks.) Thankfully I'm a lot more discriminating about what I buy nowadays, paying more attention to the type and style of products I actually use, rather than just because something looks pretty! But there were a couple of collections that captured my interest and some of them are hitting scrapbooking stores now. The chipboard stickers and cardstock stickers aimed at baby boys. Not knowing Chip's gender I've selected from both sides of this collection, but favoured the blue tones a little as I find them more versatile. There aren't that many pieces in either pack that specify boy, some of which I could cover if necessary or use on cards. At a better price point than the chipboard stickers, I didn't resist ordering the ephemera packs in both girl and boy. You can see the contents of the packs here at Crate Paper. Enamel dots, including a good range of the littlest size, in the girl scheme and the boy. I use these on so many pages, enamel dots are the easiest purchase for me to justify to myself. I liked enough of the papers in this collection to justify buying the 6x6 paper pad, which does include some gold foil pages. Many of the designs are so bold I knew I'd struggle to use them as backgrounds or in large portions, but the scaled down 6x6 size makes chopping into paper for little pops of colour so much easier. I just went with two single sheets as full 12x12, and I'd really like to see what I can create using the chunky green stripe as a background. Enamel dots and hearts, of course. There are more of the littlest size than any other so I'm definitely sold. And I rounded out the embellishments with cardstock stickers and die cut pieces. Although there are a few flamingos and cactus pots - this might be motivation to scrapbook our trip to the Galapagos Islands as I've no idea in what other context I'd use flamingos! - the majority of these packs are simpler shapes and sentiments. Feeling every bit of my 34 weeks pregnant. Really, it has been a very easy pregnancy so far but Chip is now starting to wriggle into positions that make every single thing I do uncomfortable. Experiencing lots of alien belly, where you can see my belly move independent of me. Finishing up my last week of work before I begin maternity leave. Time sheets are up to date, mandatory training completed, desk drawers cleaned out and the minutes are ticking down very slowly. Preparing for our Baby Warming celebration on Saturday night. The weather looks like it will cooperate - an absolute scorcher predicted for today but only pleasantly warm for Saturday - for our taco BBQ in the backyard. Eating pulled pork that we trialled ahead of Saturday. Tacos last night, maybe pulled pork sandwiches tonight. Drinking lots of chocolate flavoured milk. Ideal for heartburn. Writing grocery lists and to do lists. Looking at the new scrapbooking products from CHA. Crate Paper's Little You has to be the favourite of mine, although with both blue and pink based portions of the collection, I still don't know which one to concentrate on! Discussing baby names. There are a few front-runners but nothing decided as yet. Thinking about having a few days away before Chip arrives. I definitely want to spend some time at the beach. Intending on working on my December Daily but feeling stuck in the small snatches of time I can sit down at my scrapbook table at the moment. Needing to buy nappies and other practical things to finish off the nursery. And to pack a bag, ready for the hospital. December 13: I attended cutie niece's ballet recital and it was adorable! At only an hour in length, the recital was very well organised and made the most of audience and little dancers' attention spans. :) The 'making spirits bright' was word art from Ali Edwards' Storytelling with December Daily class which I cut with my Silhouette. I love the effect! December 14: The making and writing of Christmas cards. On the left I used a phone photo of me writing on a card, added a snippet of handwritten journaling directly on the photo. The overlay, printed onto white cardstock, provides a great space for adding a little embellishment. On the right I included an extra card, adhering closed using dimensional adhesive on the bottom and right sides. That created a pocket in which I could slip a copy of my Mum's Christmas letter. I didn't included the letter with my cards but I did help write it - editor-in-chief here - and I like including this snapshot of their/our year. I stamped a title onto a large label sticker which I turned over the top edge of the letter. Two wood veneer stars were inked with gold ink and glued back to back, on either side of the label. I finished Day 15 last night (a no photo spread that I'll photograph and share soon) but next I want to spend some time fully writing out the rest of the stories I want to tell. Links to all my previous December Daily pages are available here. 2016 is going to be a year like no other. In less than 2 months we will become a family of three when we hold Chip for the very first time. Another living person will be wholly dependent on Mike and I; we don't even have a dog. And after working full time for the last 9 years, I have 2 weeks left of work before beginning 12 months maternity leave. I can't envisage what my life is going to be like. Mike and I have talked a lot about plans for this year. I want to ensure we spend considered time together, going out for a 'date' at least every fortnight. We'd like to have people over for dinner more often. He's concerned about what time he'll be able to spend in the shed. I'd like to manage a daily walk to the local coffee shop. He thinks I should organise a weekly get-together of babies and friends. We're wondering if a holiday will be possible. But of course, underlying all this, we don't yet know the temperament and impact of the third family member we've yet to meet. So, I am calling 2016 the year of intention. This is the One Little Word I have chosen to be my guide for the year, an undercurrent to help shape my thoughts and actions. To me, intention is a word that encourages making plans and goals, but it's also a gentle word, recognising that plans don't always come to fruition and that's totally ok.
Having intentions. Making plans. Without a doubt, a big portion of this year will be devoted to learning how to become a mother. (And the resulting sleep deprivation, breastfeeding, nappy changes...) However, in 12 months time I don't want to look back on the year and that be all that I've done. I don't want to let my life reduce to simply getting through the day to day with a baby. Sure, there will definitely be times when that is all that I can manage. But I know I am a happier person, and I have no doubt a better mother, when I can take the time to do things that I enjoy, just for me. Maybe I'll set goals, make plans, that I come nowhere near achieving. In 8 months time taking a baby on holiday may sound like the worst idea imaginable. Maybe my priorities change. But if I don't even consider what I might do, if we don't try, well that's the best way to guarantee it will not happen. In February I am planning on undertaking another A Month of... daily photo project. I began in 2011 with A Month of Me, 2012's theme was A Month at Home and in 2013 I started A Month of Faces but never quite finished. The theme for this year will be A Month of Bump to Baby. I don't think taking a daily photo of my brand new baby will be much of stretch, but I also want to pay homage to the Bump. (With Chip due February 23rd, there is a chance I could end up with just A Month of Bump!) I hope to be creative and have some fun with the topic, but if I end up with a lot of photos looking down, trying to see my toes, that'll be fine too. Continuing on with the daily photo projects, my friend Nicole gifted me a 'One Photo Every Day of 365 Days' notebook for Christmas. Just as she has already started with sweet little April, the idea is that I add a photo and sentence or two for every day of Chip's first year. I'm also considering the 1 Second Everyday concept, taking a snippet of video to later be compiled into an overview of the year. I don't traditionally take a lot of video so even if I'm nowhere near successful on the daily aspect, encouragement to take video as Chip grows sounds like a positive for me. I also plan on sharing 25 Goals for our 2nd Year of Marriage. That year actually began on the 25th of October, so I'm running a little behind there! Previous incarnations of this project have been 30 Before 30, 30 While 30 and 30 Before Marriage. We did write a list while on our honeymoon for our first year of marriage but with 'Get Pregnant' at the top, which we didn't want to make public, last year it felt disingenuous to share. Being intentional with my time. Choosing to do things that fill me up. With fatigue and having only little snippets of free time likely to be ongoing issues, I want to make good choices about how I spend that time. Less social media, endlessly scrolling through Facebook and Instagram. More picking up a book. Less watching mindless TV. More sitting down to scrap. With over 5 weeks between beginning maternity leave and Chip's expected arrival, this is equally true of the start of the year. I don't want to waste this time. Treating my body with intention. Creating good, healthy routines. I don't have any big fitness or weight loss goals for the year but I do know I want to be active and healthy. When I stop working full time the rhythm of my days will totally change, then again when Chip arrives. I'm someone who loves a lazy day at home and considers chocolate to be another of the key food groups. Add in sleep deprivation and a little someone taking the majority of my time and attention, it will be really easy to fall into bad habits. I want to create routines for myself that encourage making good, healthy choices. The best of intentions. Being kind of myself. A good portion of this year is probably going to be really hard. At 32 weeks pregnant my body is already slowing down, everything has become that little bit harder. And Chip isn't even here yet, which is likely to be the biggest transition of my life. For all my plans and goals, I want to be patient with myself. Forgiving. This isn't expected to be easy; it's going to take time to develop a new normal. I'm going to make bad choices, abandon ideas, be lazy. And that's ok. Hopefully I'll do better the next day. Or the next week, or the next month. 2016 is full of intention. Bring it on.